Many Microsoft System Center Orchestrator and Service Management Automation (SMA) users may agree with me, that these two automation platform does not have feature rich end user portals natively. Although System Center Service Manager can be used as a user portal for triggering SCORCH/SMA runbooks, Microsoft SharePoint is also a very good candidate for this purpose. Integrating SharePoint with Orchestrator and SMA is not something new, many people have done this already. i.e. To me, not only I am using SharePoint 2013 in my lab; SharePoint Online from my Office 365 subscription, I also have no choice but using SharePoint 2010 in real life. In my opinion, it is complicated to write SMA runbooks to interact with SharePoint (Using SharePoint web based APIs), not to mention the different versions of SharePoint also dictates how the runbook should be written. It is easier to use Orchestrator as a middle man in between SMA and SharePoint so we can use Orchestrator’s SharePoint integration pack. After the MP catalogs posts were published, I have decided to spend a bit more time on the SharePoint Client Component SDK and see if it can help me simplify the activities between SMA and SharePoint. I was really happy to find out, the SharePoint Client Component SDK works for SharePoint 2013, SharePoint Online and SharePoint 2010 (limited). So I have decided to update and extend the original module, making it a generic module for all 3 flavours of SharePoint. After couple of weeks of coding and testing, I’m pleased to announce the new module is now ready to be released. I have renamed this module to SharePointSDK (Sorry I’m not really creative with names ). The functions listed above are the core functionalities this module provides. 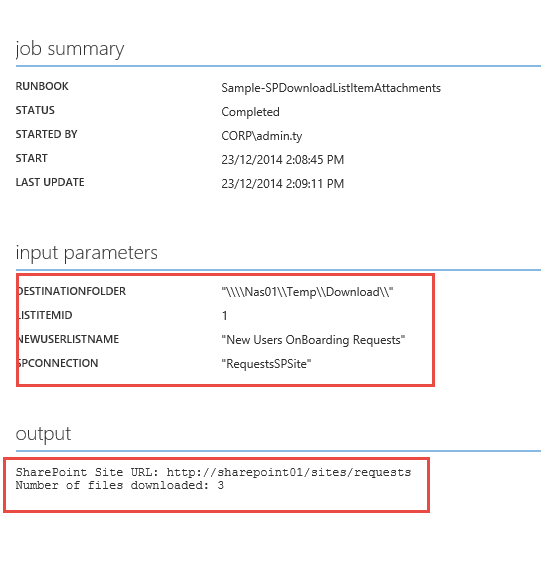 it provides simplified ways to manipulate SharePoint list items (Create, Read, Update, Delete). These functions are called by other functions in the modules. It is unlikely that runbook authors will need to use them directly. 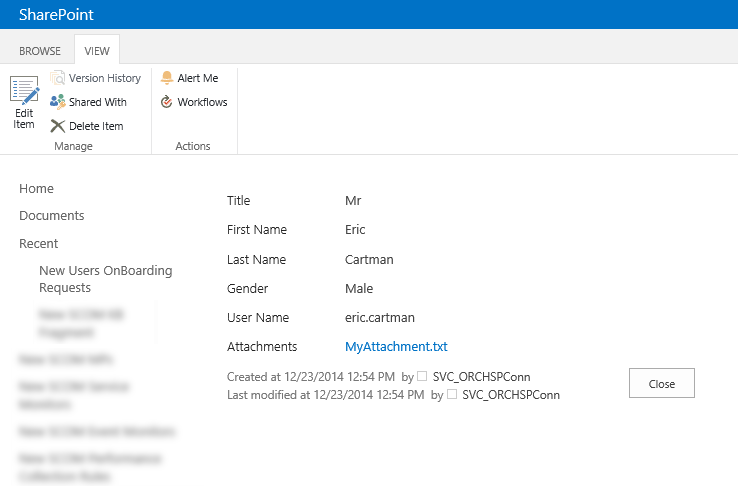 As the names suggest, these functions can be used to manage attachments for SharePoint list items. Directly creating a text based file with some contents as a list item attachment. 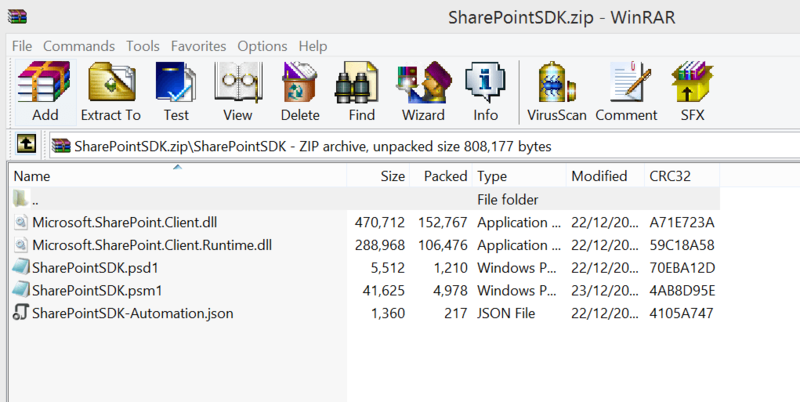 SharePointSDK-Automation.json – SMA Integration Module Meta File (where the connection asset is defined). The zip file you’ve downloaded from the link above DOES NOT contain the 2 DLL files. I am not sure if Microsoft is OK with me distributing their software / intellectual properties. So, just to cover myself, you will need to download the SDK (64-bit version) from Microsoft directly (https://www.microsoft.com/en-us/download/details.aspx?id=35585), install it on a 64-bit computer, and copy above mentioned 2 DLLs into the SharePointOnline module folder. Once the SDK is installed, you can find these 2 files in “C:\Program Files\Common Files\microsoft shared\Web Server Extensions\15\ISAPI\” folder. Once the DLLs are placed into the folder, zip the SharePointSDK folder to SharePointSDK.zip file again, and the integration module is ready. Name: Name of the connection. UserName : a User who should be part of the site members role (members group have contribute access). 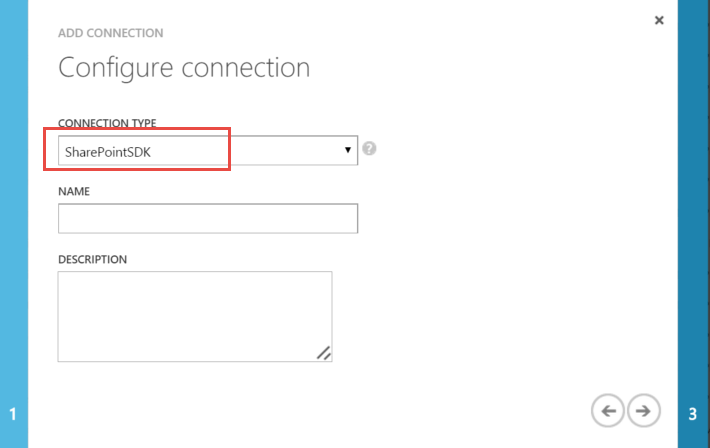 If the site is a SharePoint Onine site, this username MUST be in the email address format. (i.e. yourname@yourcompany.com). I believe this account must be an account created in the Office 365 subscription. I have tried using an outlook.com account (added as a SharePoint site member), it didn’t work. Password: Password for the username you’ve specified. IsSharePointOnlineSite: Boolean field (TRUE or FALSE), specify if it is a SharePoint Online site. I’ll now go through each sample runbook. 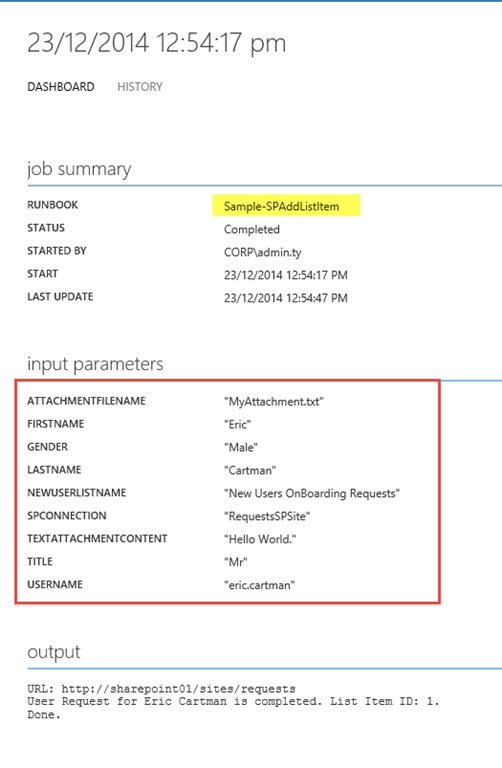 This sample runbook creates a brand new dummy new users requests list on your SharePoint site. The list created by this runbook will then be used by other sample runbooks (for demonstration purposes). ListName: The Display Name that you’d like to name the new users requests list (i.e. New Users OnBoarding Requests). This runbook demonstrates how to retrieve all the fields of a particular list. This runbook adds an item to the New Users Requests list the previous runbook created. It also demonstrates how to create a text file attachment directly to the list item (without having the need for an existing file on the file system). 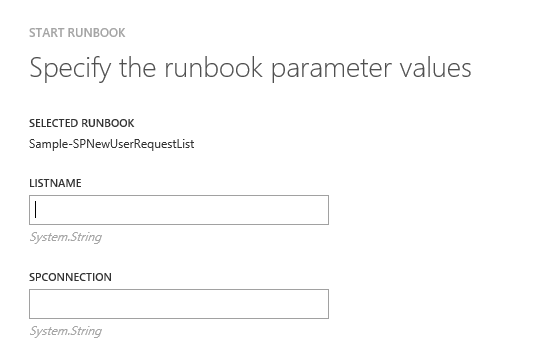 This runbook can be used to update fields of an existing list item on the New Users Requests list. This runbook can be used to retrieve ALL items from a list. Each list item are presented as a hash table. This runbook can be used to retrieve a single item from a list. 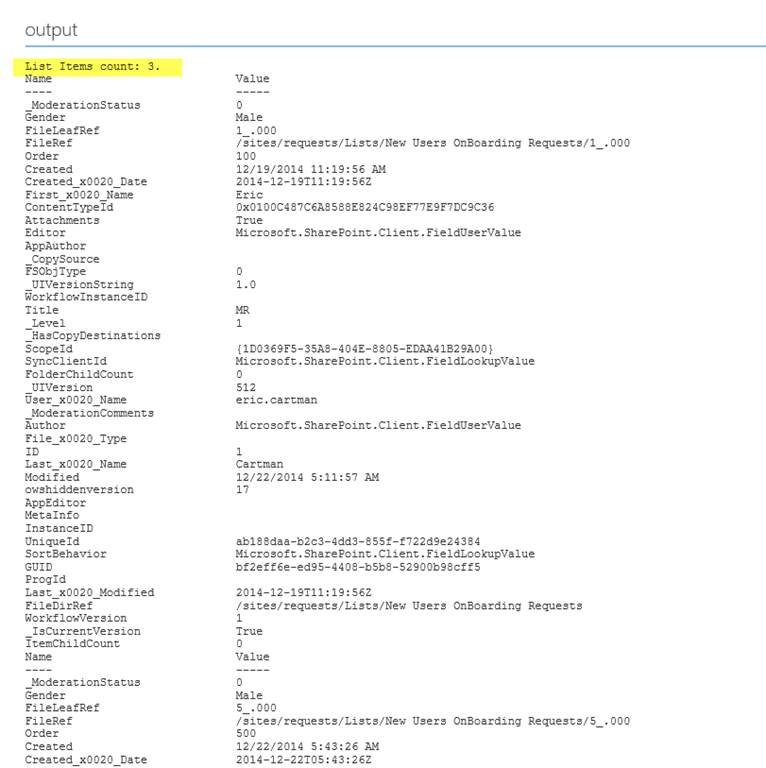 This runbook deletes a single list item by specifying the List Item ID. 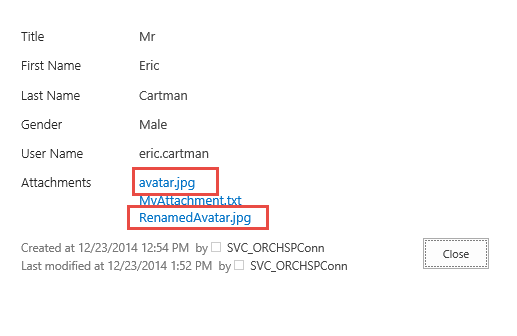 This runbook demonstrates how to delete an attachment from a list item (by specifying the file name). As we all know, SMA modules are simply PowerShell modules (sometimes with optional SMA module meta file .json for creating connections). Although this module is primarily written for SMA, it can also be used in other environments such as a regular PowerShell module or in Azure Automation. 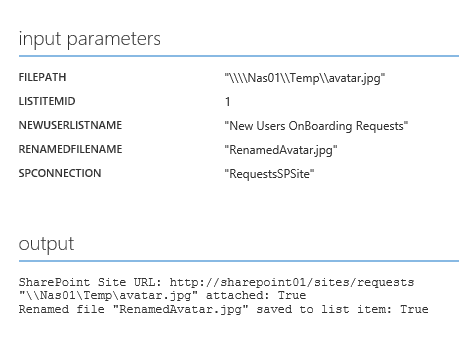 When using it as a normal PowerShell module, instead of passing the SMA connection name into the functions inside the module, you may provide each individual value separately (Username, password, SharePoint Site URL, IsSharePointOnlineSite). When using this module, most of the operations around the list item only takes very few lines of code. 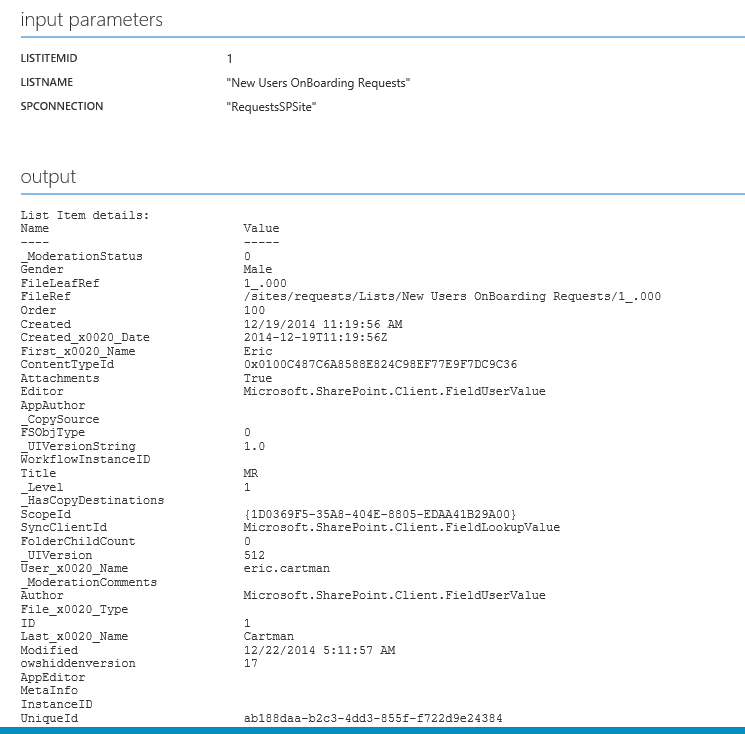 If you use SharePoint 2013’s REST API, the script will be much longer than what I’ve shown above. 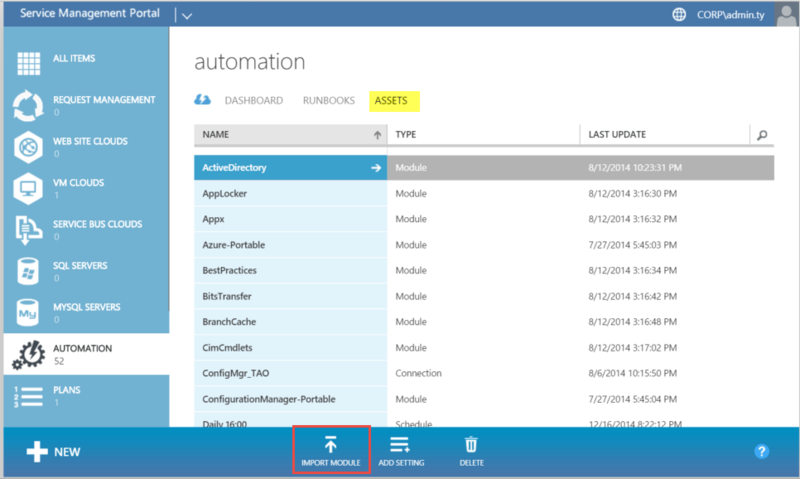 The SharePoint REST API has been updated in SharePoint 2013. 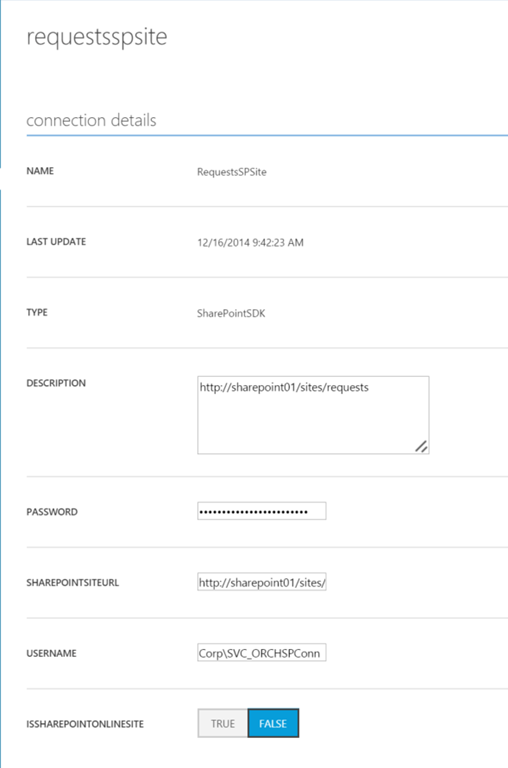 Therefore, if we are to use the REST API, the code for Share Point 2013 would look different than SharePoint 2010. Additionally, when throwing SharePoint Online into the mix, as I mentioned previously, it requires different type of credential for authentication, it further complicates the situation if we are to use the REST API. This makes our scripts and runbooks less generic. 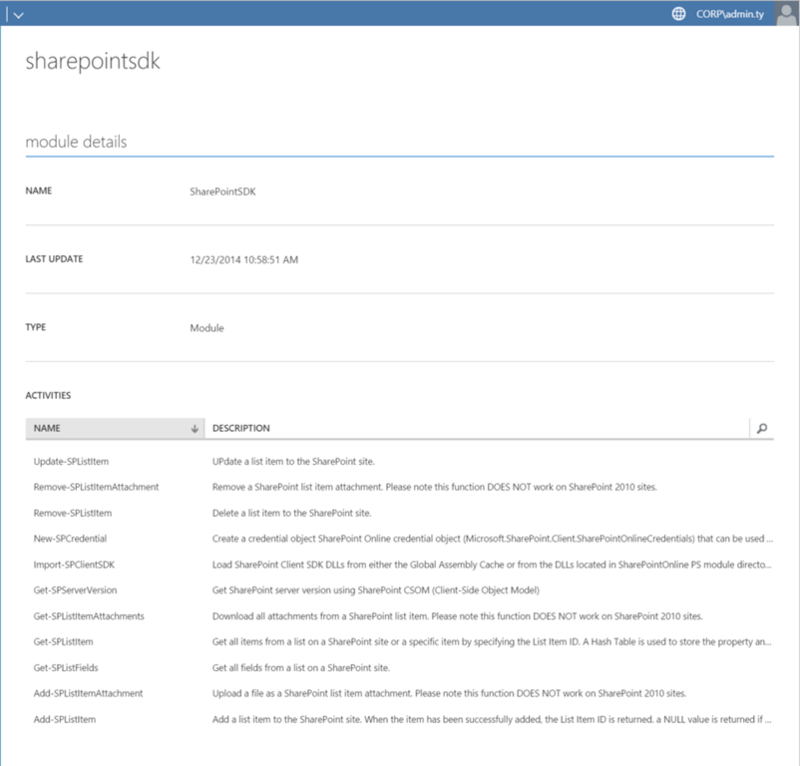 By using this SharePointSDK module, I am able to use the same runbooks on SharePoint 2010, 2013 and SharePoint Online sites. If you are using SMA and SharePoint together, I strongly recommend you to download this module and the sample runbooks and give it a try. 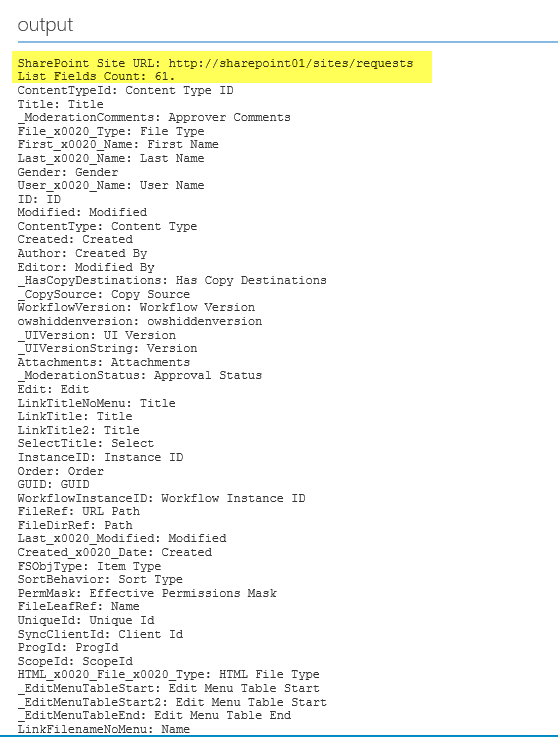 If you have a look at the sample runbooks, I’m sure you will realise how easy it is to write PowerShell code interacting with SharePoint. Lastly, I’m not a SharePoint specialist. If you believe I’ve made any mistakes in my code, or there is room for improvement, I’d like to hear from you. Please feel free to drop me an email . Can you please tell me how have you entered at the runbook the two 2 input parameters?